Ten years ago, on February 7, 2009, the Black Saturday bushfires killed 173 people. More than 2,000 houses were destroyed in Victoria, including at Kilmore, Kinglake, Vectis (Horsham), Narbethong, Marysville, Strathewan, Beechworth, Labertouche (Bunyip), Coleraine, Weerite, Redesdale, Harkaway, Upper Ferntree Gully, Maiden Gully, Bendigo, Eaglehawk, Lynbrook, St Andrews, Flowerdale, Narre Warren, Callignee, and my home town of Churchill, where my mother and father still lived. Their home wasn't burned, but many of their neighbours were badly affected by the worst bushfire day in Australia's history. A week before, my uncle and aunt had to seek refuge at Mum and Dad's place when a fire ember landed in their front yard during the Boolarra bushfires. Mum has since passed and Dad still lives in Churchill. Climate change means more days of extreme heat, longer heatwaves and more frequent droughts. Droughts now occur further south than in the past and have been increasing in Australia's southeast, including Tasmania. The records continue to tumble, and the evidence of dangerous climate change continues to mount. Back in 2008, John Brumby was Premier of Victoria and Kevin Rudd was Prime Minister. I was working on climate change for the Victorian government, developing projections for increased risk of bushfires. A 2005 study had already predicted an increase in fire weather risk throughout most of southeastern Australia over the coming decades, with "very high" and "extreme" fire danger ratings likely to increase in frequency by 4-25% by 2020 and 15-70% by 2050. The 2008 Garnaut Climate Change Review also warned that fire seasons will begin earlier, end slightly later, and generally be more intense. "This effect increases over time but should be directly observable by 2020," it said. In 2015, a further study by CSIRO and the Bureau of Meteorology concluded that: "Projections of warming and drying in southern and eastern Australia will lead to increases in [forest fire danger index] and a greater number of days with severe fire danger. In a business as usual scenario (worst case, driest scenario), severe fire days increase by up to 160-190% by 2090." 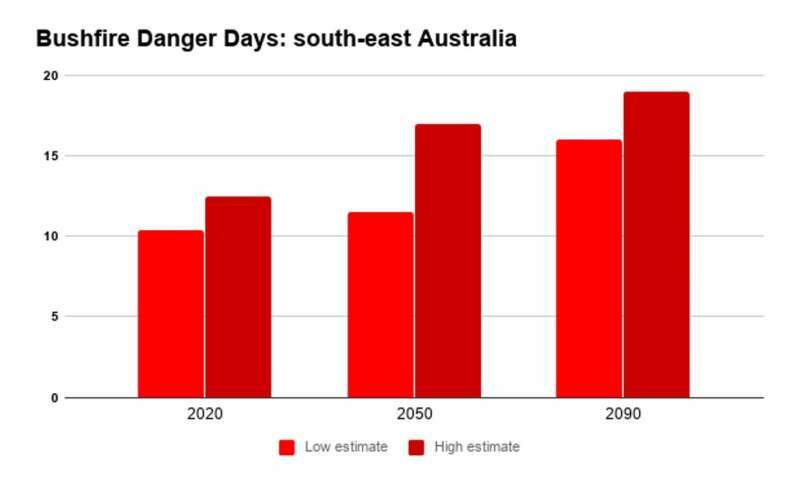 This shows that while there is some uncertainty as to the extent of increase in the number of bushfire danger days in southeastern Australia, the situation is undoubtedly getting worse, and it's time for action. Our grandfathers and grandmothers had the wisdom to build amazing water infrastructure, protected by the "closed catchments" that give Melbourne and Victoria some of the best water in the world. Bushfires are a major risk to these water supplies – particularly in the catchments of major dams such as the Thomson. Major bushfires often occur in time of severe drought. Black Saturday itself happened towards the end of the 15-year Millennium Drought, when Victoria's water supplies were already strained. I remember vividly the then chief executive of the Melbourne Water Corporation urging the government to deal with any fire in the Thomson Dam catchment immediately, given the threat to Melbourne's water. Fortunately, amid the devastation of Black Saturday we avoided major disruption to our water supplies. But this risk poses a huge challenge to both firefighters and policy-makers. The rule is that protection of human life is ranked above assets and infrastructure, and rightly so. But when there is a clear and present danger of towns and cities going without water, it's also true that safeguarding water means saving human lives in the ensuing days. In 2050 my daughter Astrid and my son Atticus – Mum and Dad's grandchildren – will be 45 and 43, respectively. I hope it is not too late for our leaders in Canberra, Davos and throughout the world to wake up and take urgent action to limit global warming 1.5℃. That would mean that the most fearful predictions of our bushfire future never come to pass. Black Saturday bushfires: Have we fixed a flawed system?